The pilot shot to the right, to the left, straight forward and all around. In no time, Nazis, whose the blazing planes spun toward the earth, who burned and tumbled with it. All around me was clouded with smoke and glimpses of fire. 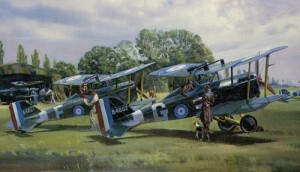 Suddenly I saw the famously deadly ground attack aircraft, lining up to my plane, and the Russian pilot opened up the top of his cockpit. I saw and I could not believe my eyes: the long hair was waving in the wind. It was a woman-pilot who saved my life. The wonderful unknown “Russian Fairy”, how I started to call her since then disappeared off the sky as Cinderella off the dancing floor at the Ball. Where are you now, my flying Cinderella-“Russian fairy”? I remember as vividly, as today, your hair flying in the wind, your bravery and the quiet satisfaction of defending one’s country, all against a backdrop of love for freedom of flight. Since 1945 passed 65 years”. Vern Faltekval from Armstrong, BC, finished his story in a deep sad silence. Next to him sat Tatiana Zouenko, a Russian lady who was on a traveling tour bus together with her daughter, heading from Vancouver for Calgary once, when somewhere in the middle of the route one gentleman dropped in. All seats were taken, everybody at the front was asleep or pretending to be asleep. In other words, nobody seemed to offer a seat to this gentleman. Tatiana took an initiative in her hands. Lifting up her right hand she invited an old man to sit next to her as she had a vacant seat nearby: her daughter was tired and preferred to have a nap at the rear of the bus. Tatiana grasped immediately by the man’s gait that he was a military man as they all are distinguished themselves by something special in their physics because of training, perhaps, life style standards. Regardless the different countries, nationalities, faiths, the military people by looks have something in common.Tatiana sensed it with all her heart. After courteous introduction himself as he said: “I am a descendant of Vikings, 93 years old, the last WWII veteran from the Armstrong area, but quite possible the entire province”. When he knew that Tatiana was Russian he told his story what was mentioned above. 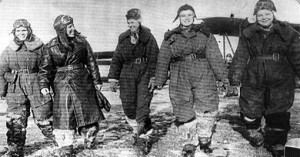 Who are you, Airwomen of the Red Star? Over 800.000 women served in the Soviet armed forces: nearly 200.000 of them were decorated and 89 of them eventually received the Soviet Union’s highest award, the hero of the Soviet Union. Watch video of their training. Maybe it was Valentina Grizodubova (1910-1993), who flew non-stop with Marina Raskova on an AIR-12 for a world record for women’s long distance non-stop flight, then in 1938 together with Paulina Ossipenko set another world record with their a non-stop flight of 5,900 km from Moscow to Siberia on ANT-37. 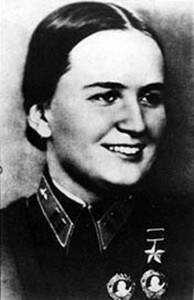 During WWII, Valentina Grizodubova commanded a bomber squadron. She also served as Chairman of the Women’s Anti-Fascist Committee. She was awarded the Soviet hero star, Soviet red Star, the Order of the Red Banner, the Order of Lenin, and wore the medal of a member of the Supreme Soviet. An inspiration in her time and later, Valentina Grizodubova appears on a stamp of the Soviet Union. In the 1990s, the 1937 world record flight inspired a re-creation by two American women. Who knows who was a Vern Flaketval’s inspiration: Marina, Valentina or Paulina? Now when they’re mostly gone, their pictures are still with us, when they were young, beautiful and brave, Russian Fairies of the Red Sky. in your web site. After we have completed our email contacts I promise to make comments. to do so) I take that very seriously.